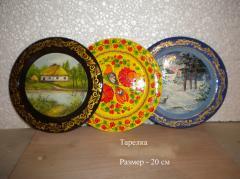 Plate wooden with an art list of handwork. The product is varnished. 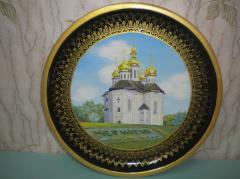 Diameter is 20 cm. We offer a variety of a list. Quality of production is confirmed with the certificate of the State sanitary examination. Plate wooden with an art list. Diameter of 45 cm. The product is varnished. Handwork. Quality of production is confirmed with the certificate of the State sanitary examination. 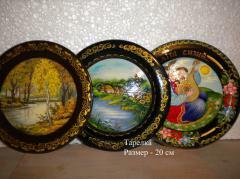 Unbelievable price on Decorative Plates in Chernigov (Ukraine) company Fabrika Hudozhestvennye promysly, OOO. Wide choice of quality products at affordable prices.